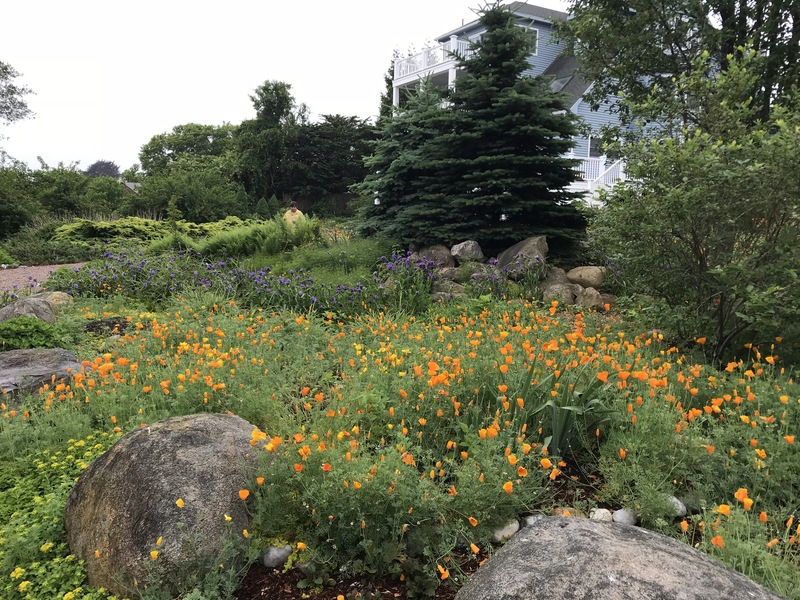 It’s garden tour season, a great opportunity to check out some of the more interesting gardens in your area and donate to a good cause at the same time. 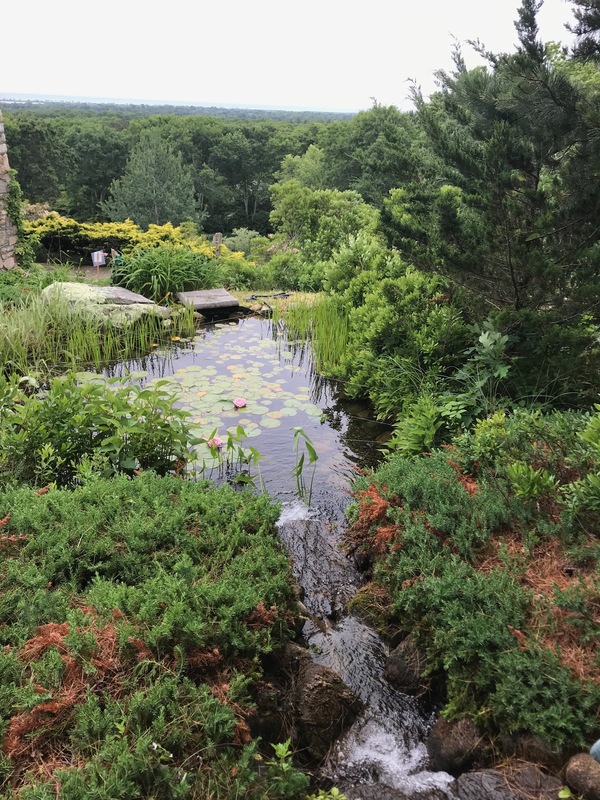 This water feature, one of many in a fabulous and luxurious garden on a hill in Charlestown, R.I., is one of the reasons I try to do the “Gardens by the Sea” tour. The proceeds help fund a local library. 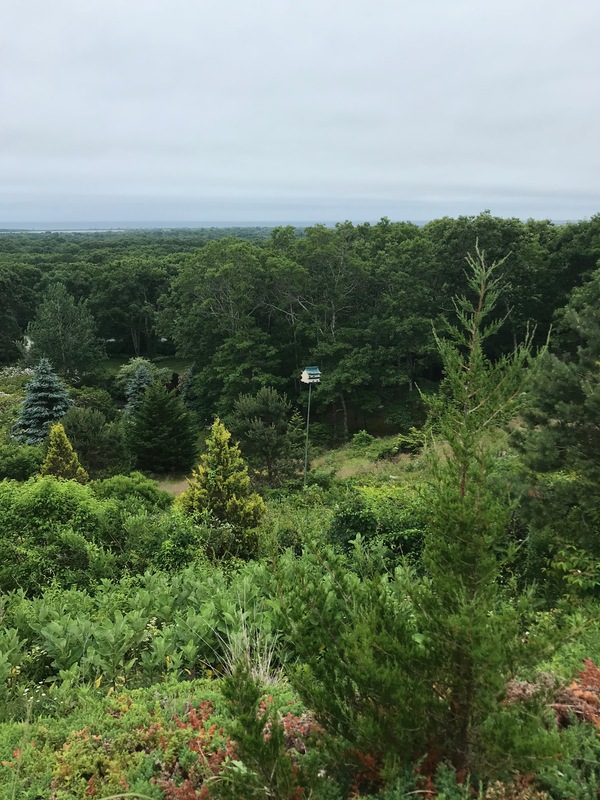 Another view of the same garden, looking out at the distant ocean and Block Island. Obviously, this is not the kind of garden most of us would ever be able to afford, but it had several features that the gardens on some other tours do not, things that I absolutely insist on if I am going to pay $15 or $20 for a ticket/tour booklet. THE OWNERS PRESENT: The owners in the above garden were greeting visitors, and they were also engaged in their garden. PLANT MARKERS: The more obscure plants should be identified so visitors know what they are. NEATNESS: I have gone on tours where I have seen messy brush piles and even trash just outside the garden and visible to visitors. I did not pay $20 to see your trash. 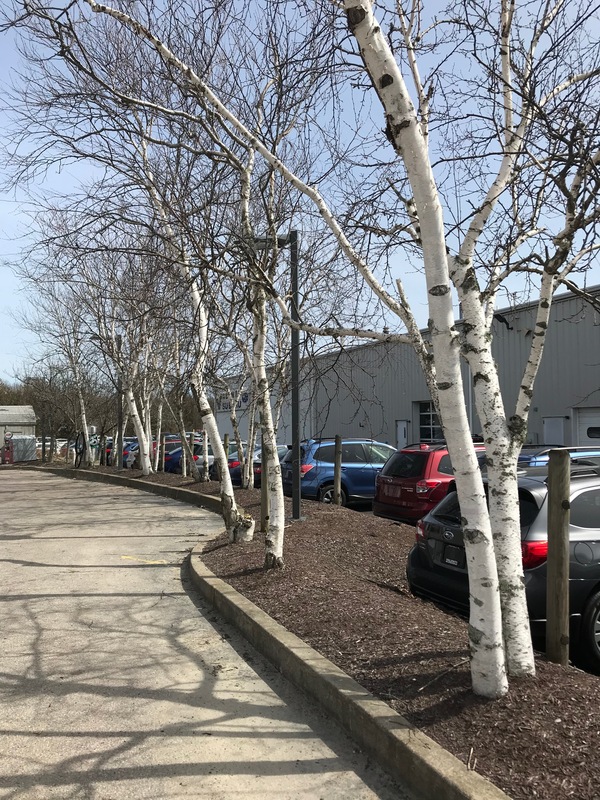 HONESTY: I visited a garden touted as “sustainable” and when I came upon a fruit tree orchard and asked the owner how he grew apples without spraying, he readily admitted that he sprayed. RESPECT THE GUESTS: Don’t charge me to see a garden that isn’t weeded and dead-headed. And don’t cram in a bunch of Home Depot impatiens at the last minute to fill in your bare spots. KNOW YOUR PLANTS: Nothing makes me crazier than visiting a garden where the owner doesn’t even know the names of his or her plants. SHOW-WORTHINESS: Unfortunately, it seems as though garden tour organizers will accept almost anything these days. 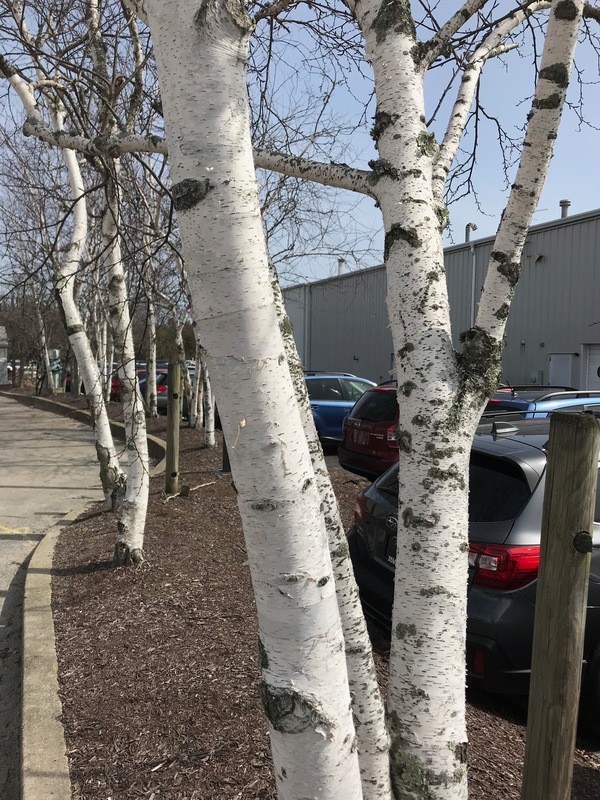 Some gardens will have little patches of tended plants surrounded by out-of-control trees and shrubs and general neglect. I have spent weeks helping gardeners prepare for tours and on tour day, those garden were as perfect as we could make them. One of the reasons I enjoy the Gardens by the Sea tour is the generally high caliber of the gardens. Out of the six we visited, three were worth the trip, which is a pretty good average. Another great tour is the Secret Garden tour in Newport. Well worth the drive. This is another garden we loved. 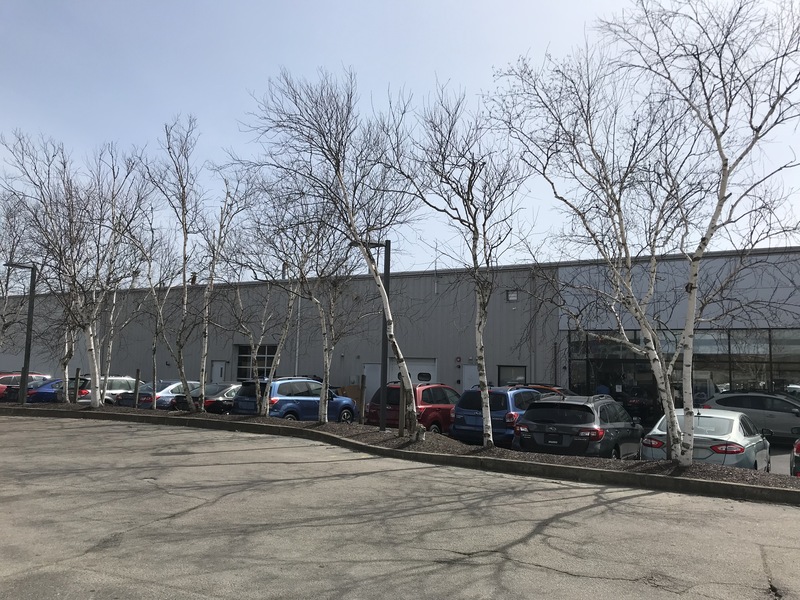 The location! 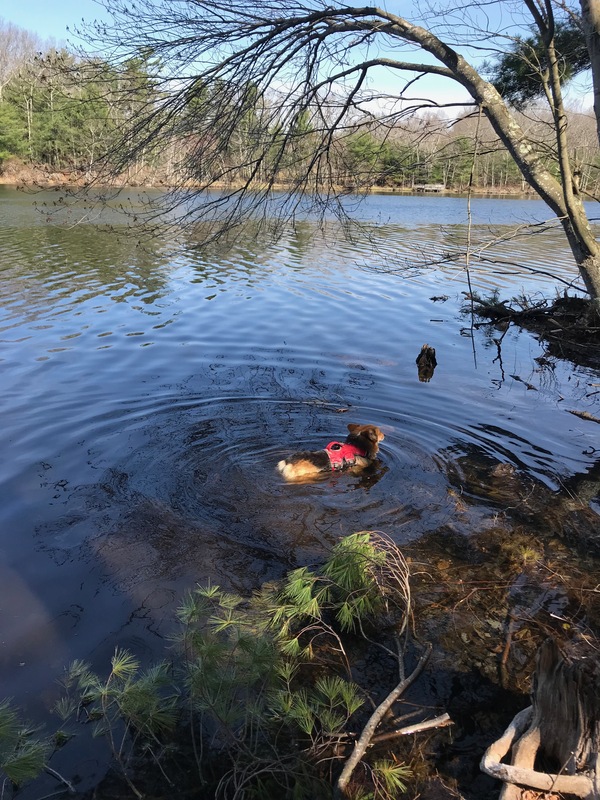 That’s a fresh water pond, not the ocean. The charming house blended unpretentiously into its wooded setting, but the garden wasn’t dark. 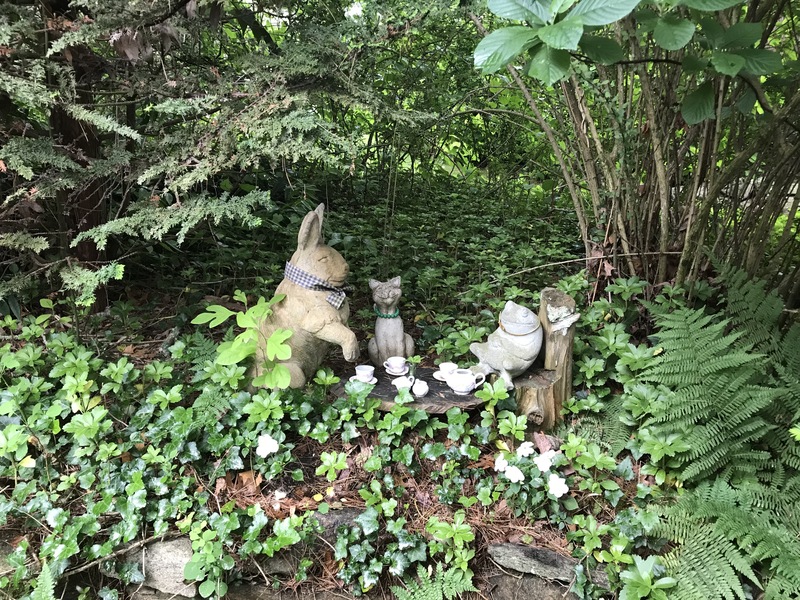 We came upon this whimsical scene tucked into the ferns. A tasteful alternative to all those fairies. Art in the garden can add considerable interest. 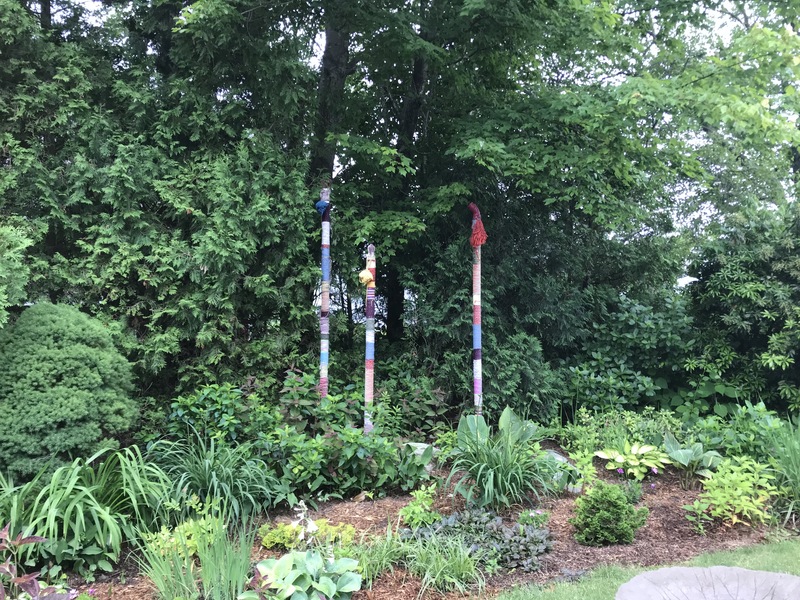 The decorated poles in the photo below are also in the garden by the pond. It was a peaceful place that made me want to sit down and read – or nap – or take a swim. Then there was this garden, a sea of California poppies. We did not see any particular design here, just an effort to fill spaces with color. That’s a worthwhile garden goal and the orange is pretty, but we didn’t learn anything from it or come away with new ideas. I guess my conclusion on the subject of garden tours is, if you believe your garden is something people will pay money to see, please make sure it’s worth the price of admission. I recently spent several days visiting my family in Canada. I have lived in the United States for so long, I have to refresh my knowledge of my former homeland’s cultural icons. This is one of them: the doughnut. These aren’t your run-of-the-mill doughnuts. 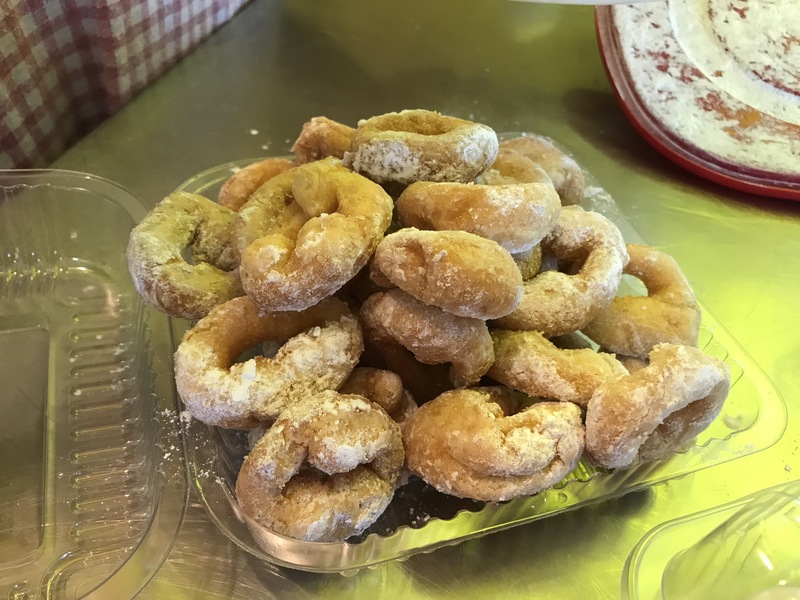 These are made fresh to order, at a tiny shop which has won “Best Doughnuts in Canada” two years in a row, which, in doughnut country, is a major achievement. 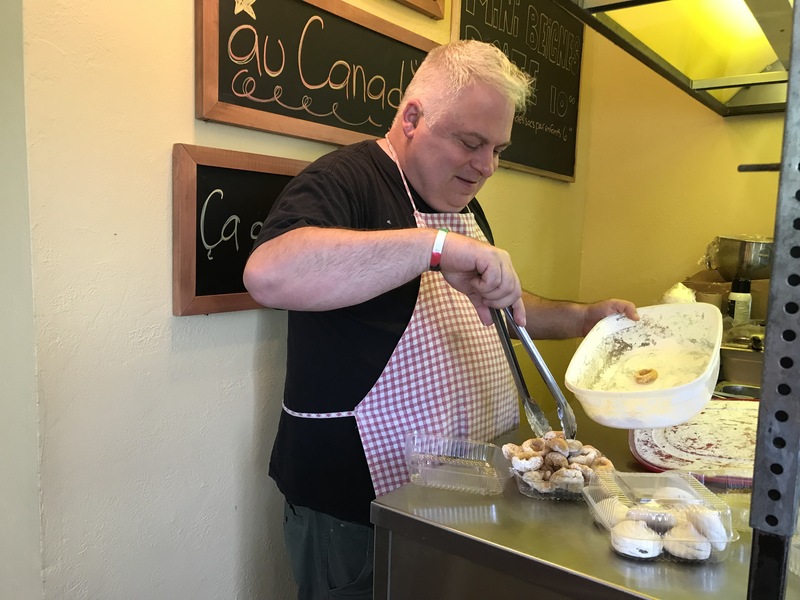 Here are our doughnuts being finished in powdered sugar, or as they say in Canada and the rest of the Commonweath, “icing sugar.” He allowed them to cool for a few minutes before dusting them, but they were still a bit warm when we had our first bite. Ecstatic eye-rolling ensued. Speaking of the Commonwealth, and food, we also stopped at a store that specializes in all things British, Clarence and Cripps. Craving old-fashioned English toffees? Got’em. Scones you can bake at home? Yup. And proper English cheddar? Yes! 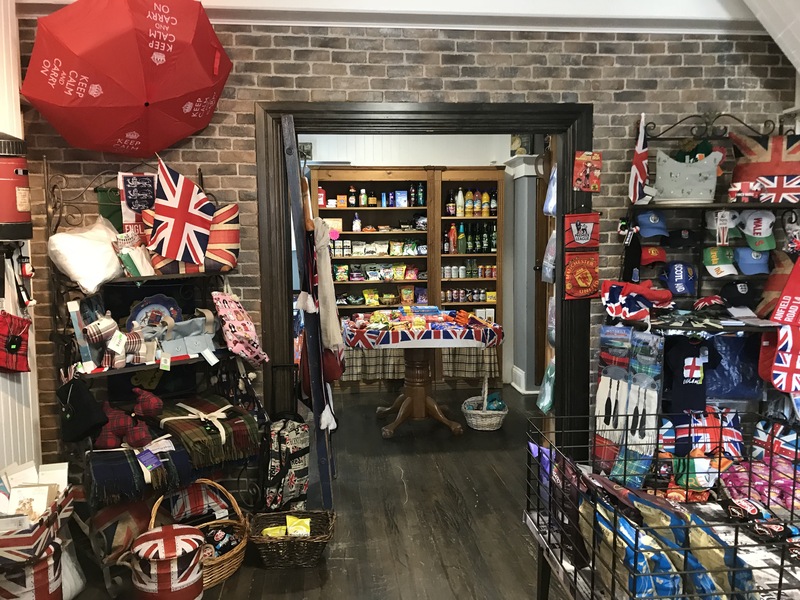 This store has tons of English cookies and candies and tea and other foods, in addition to a large selection of souvenirs. I was told that their royal wedding party was a real blow-out. 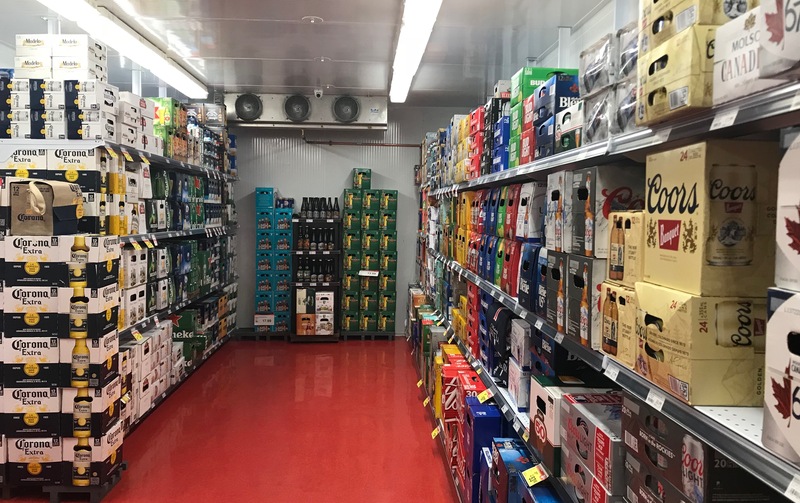 My sister needed to buy beer (she plays hockey so naturally that’s her beverage of choice) and we stopped at the local supermarket, which, like every other supermarket and convenience store (they’re called depanneurs in Quebec) has a giant walk-in beer fridge. This is just one half. The fridge was so large it was impossible to get the entire thing in the frame. Being of “a certain age” I could have spent all day in there. It’s very refreshing on a hot summer day. There are few scents more tropical than that of Plumeria. It is often used to make leis, and we saw it growing everywhere in Hawaii. The waxy blooms give off an intoxicating but not cloying fragrance. 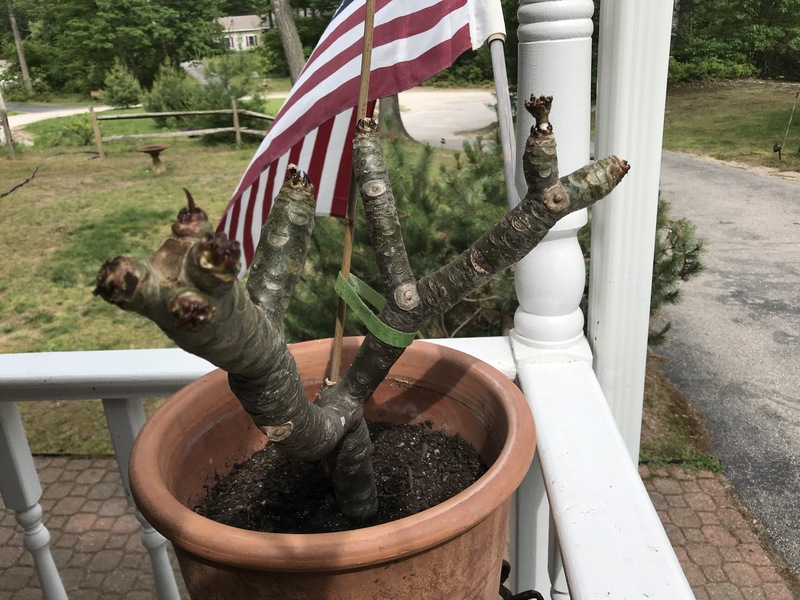 I have always wanted to have a Plumeria, but it is usually grown in very warm climates as a shrub or small tree and it is definitely not winter-hardy, so living in Rhode Island, I thought I was out of luck. Then I found a grower in Florida who sells a cultivar that is especially for containers. (Click on “Patio Plumerias” to see the one I bought.) After talking with them about growing requirements, I had to have one. They aren’t cheap, but I am an adventurous gardener who likes to try new plants every year, and this patio type can be brought indoors in the winter. 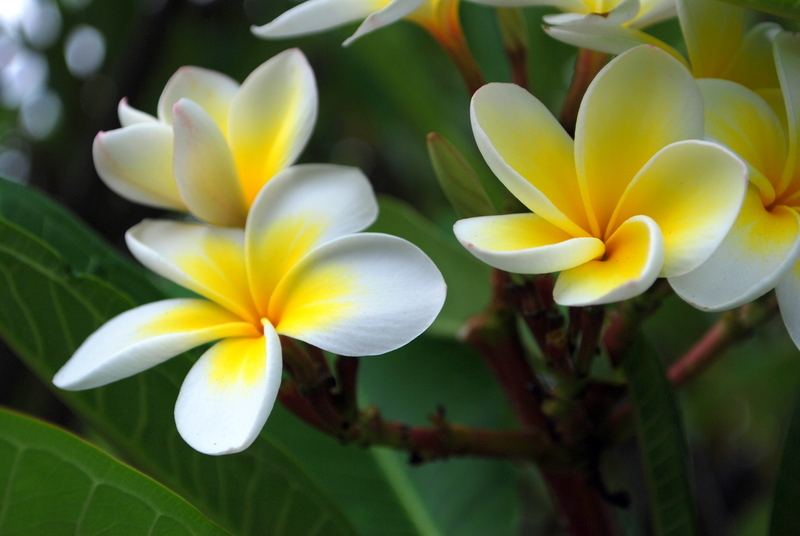 My patio Plumeria will have white and yellow flowers like the ones in the above Wiki photo. Right now, though, it doesn’t even have leaves. See what I mean? This is a Plumeria cutting. That’s how they are shipped. The instructions say to support it with a stake until you are certain it has rooted, so that’s what I’m doing. I am also misting the tips of the branches every two or three days, also as instructed. Plumerias require really good drainage and as much sun as you can give them. 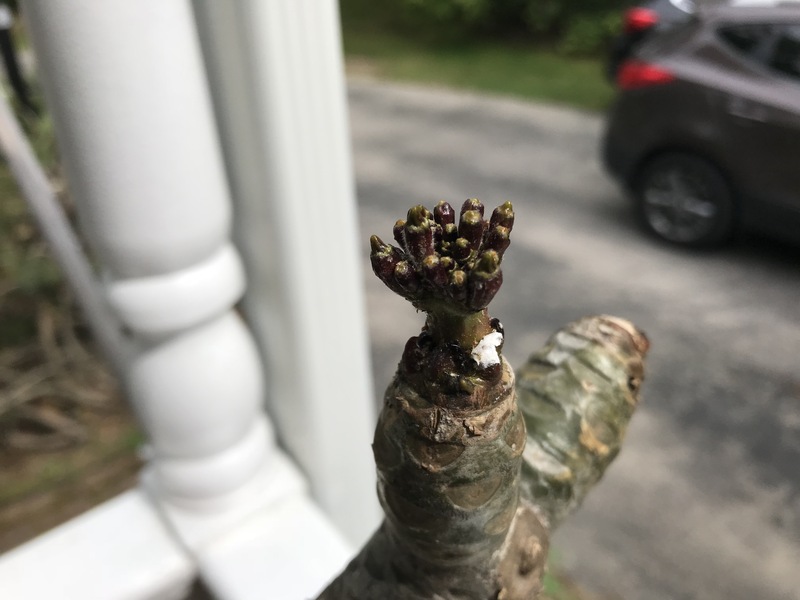 Here’s one of the branch tips, which, I believe has flower buds already, although they could be leaf buds. I’m learning as I go with this plant. Of course, I will post more photos as it grows and hopefully, blooms. 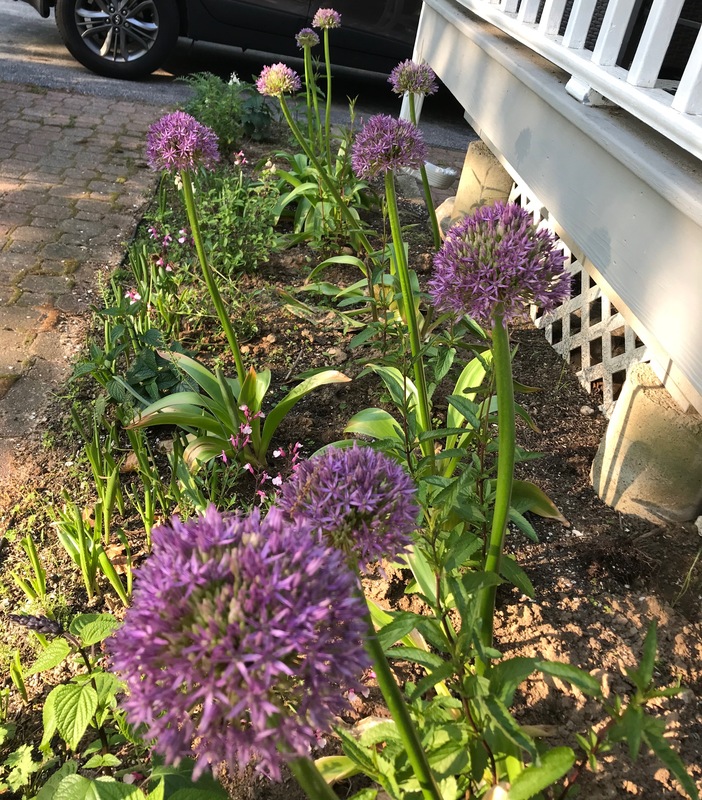 These are the alliums I planted last fall. They were pricey, but so worth it for their impact. This is “Globemaster,” the cultivar I have always wanted. It’s a big plant with a 3 to 4-foot stalk. Because it’s in the onion family, deer and rodents won’t touch it. Globemaster lives in the bed where I used to have dinky little shrubs that didn’t even produce fruit or flowers. So, out they went. Here’s a closer look at the cluster of flowers. They are pinker than they appear in the photo. 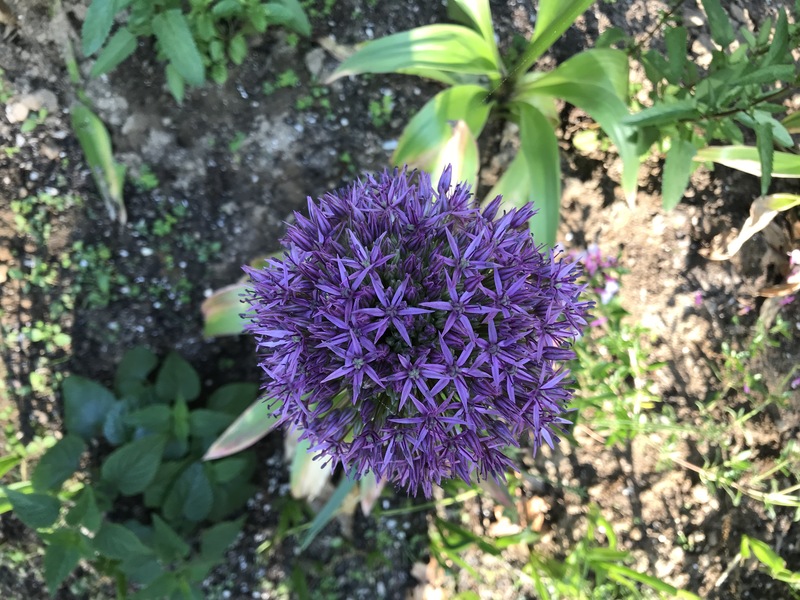 The alliums are a bright spot in an otherwise disappointing spring. I lost so many narcissus last winter, after planting several hundred around the property. The first spring they were gorgeous, but this year, almost nothing emerged. And the rock garden iris I had planted (Katharine Hodgkin) completely disappeared. I am not sure if it got too cold for some of them or whether the series of storms we had in March finished them off. This is what remains in the bed; a couple of alpine plants and some species tulips. I must say my scilla and crocus came up and flowered bravely. 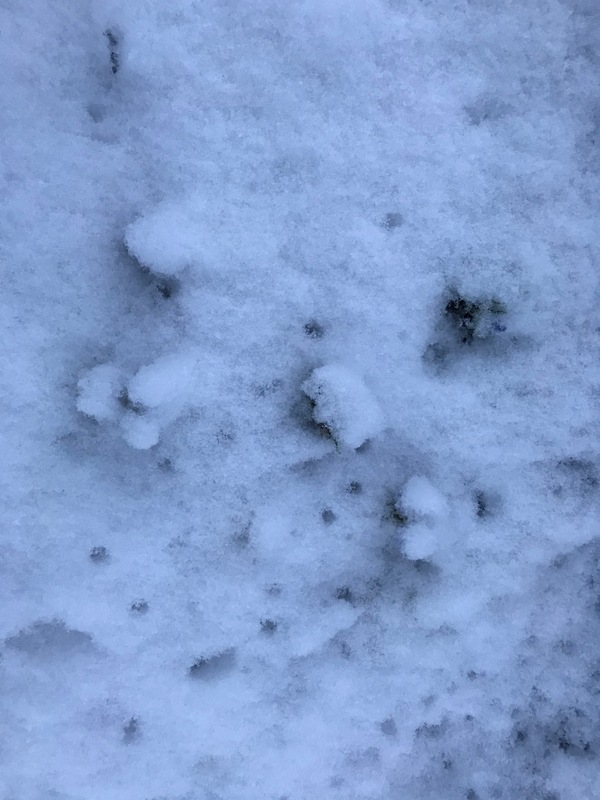 The crocuses were repeatedly buried by snow. This is one of the narcissus I lost. It is called “Avalanche,” and I loved it because there were several flowers on each stem, and those flowers smelled divine. I would really like to plant it again, and will probably give it one more try. 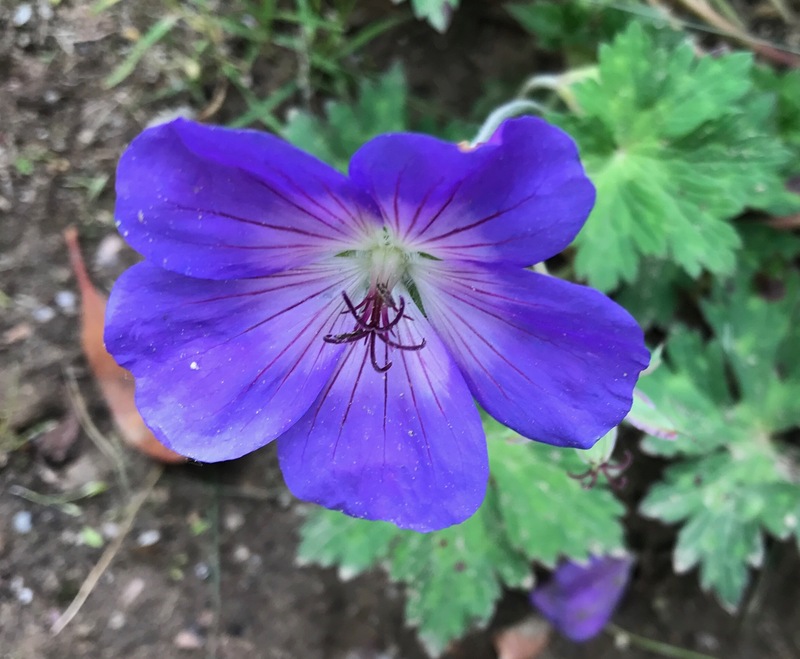 Yet another loss: perennial geranium, “Azure Rush,” which I raved about last year because it’s bluer than Rozanne. 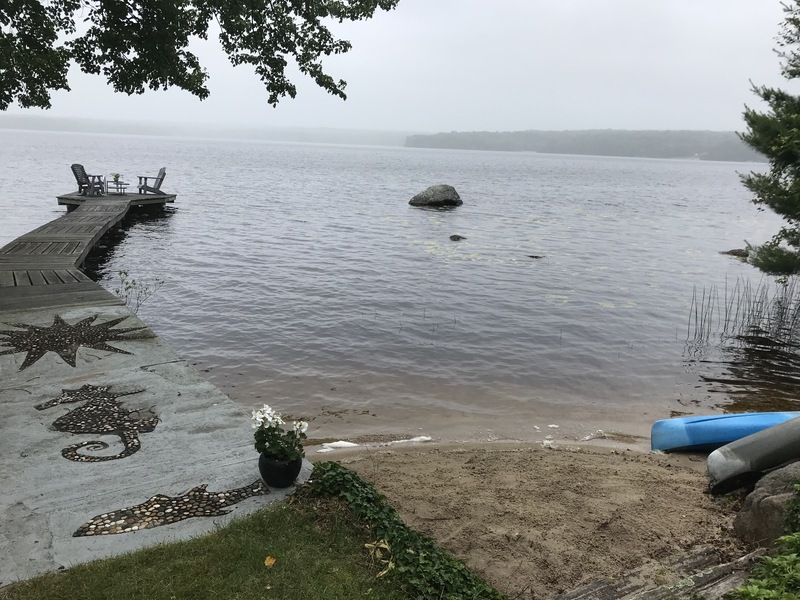 Well, despite its supposed hardiness from Zone 5 to 8 (we are in R.I., where zones range from 5b to 7a, depending on how close you are to the ocean) Azure Rush has disappeared, too. 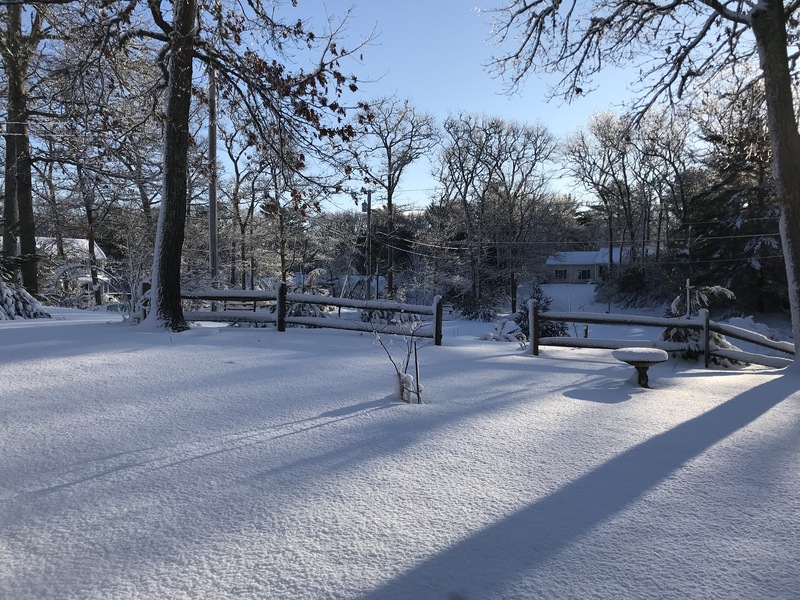 So, I am not sure it is really hardy to Zone 5 after all. Either way, it’s a bummer. I have heard from other gardeners that they, too, lost perennials and bulbs, so maybe I am not alone. 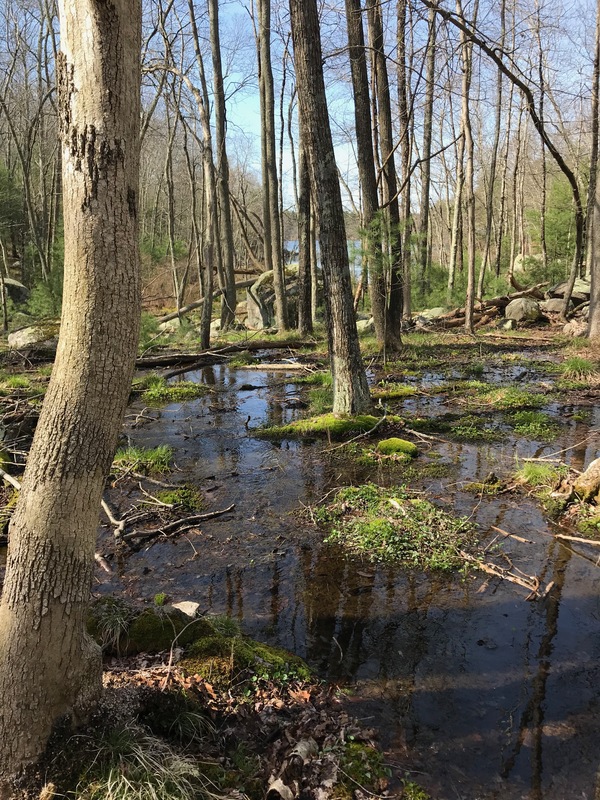 It’s full on, in-your-face spring here in Rhode Island, and so far, it’s been a great one for frogs, with all the water. 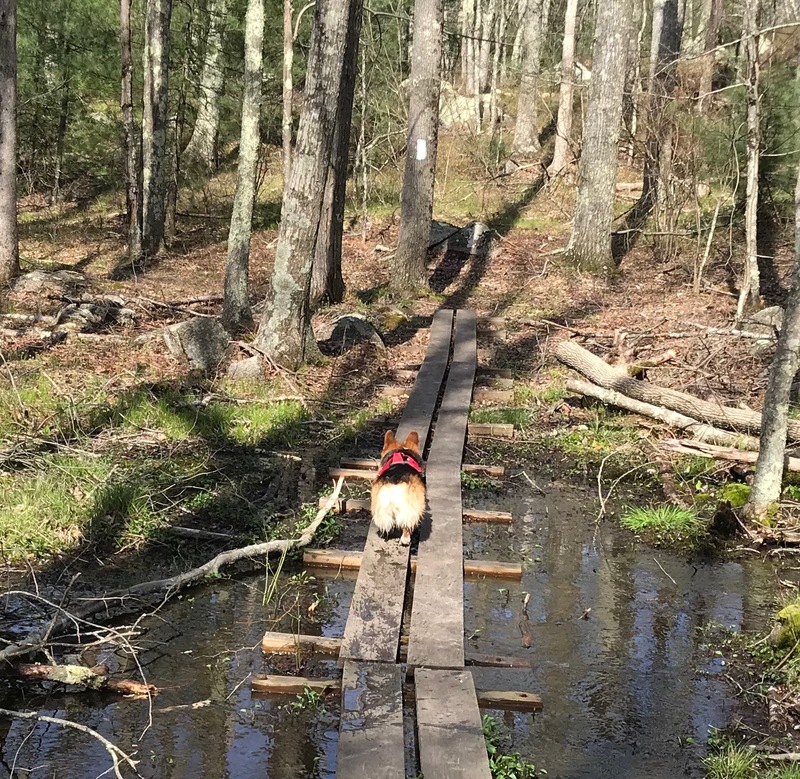 My friend and I took a hike recently on one of our favorite trails, and it was even a bit too warm (in the 80s) for my taste. …especially when there’s an opportunity to swim. 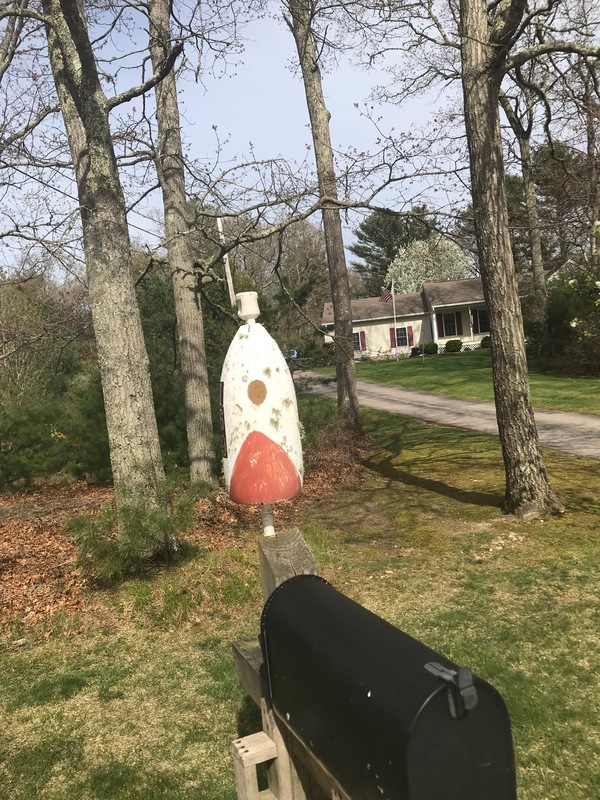 On a completely different topic, my neighbor has a lobster buoy attached to his mailbox, and about a year ago, a woodpecker excavated a very fine hole in it. Walking by it the other day, I noticed a chickadee head poking its out of the hole, and I saw the bird again this morning. I am hoping she’s nesting in there. There are a couple of other interesting nests in our trees right now, and not all of them belong to birds. I’ll keep you posted. I was working in my home office last Tuesday, when my eye was drawn outside, to a spot of blue. Too dark for a bluebird, and anyway, our neighborhood isn’t bluebird habitat. 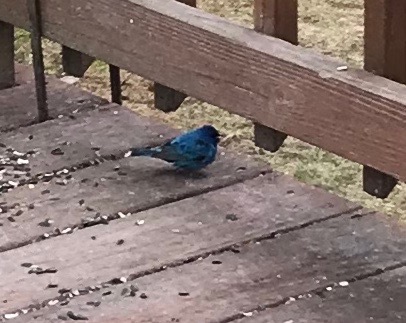 It could only be one bird: an Indigo Bunting. This wasn’t a first for me. I saw one several years ago while visiting friends on the north shore of Lake Superior, but this was the first time I’d seen one in Rhode Island. I went back to my work and when I was done, I went into the living room and glanced at the back deck and there he was. The bunting has returned every day, feeding on sunflower seed and suet. But wait. There’s more! 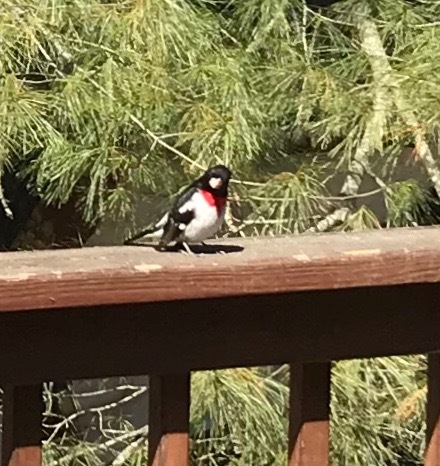 The same day the bunting arrived, I also had several Rose-breasted Grosbeaks, females and males. Maybe it was because we’d had a storm the day before, (or it was kismet) but my feeding station looked like a photo on a bag of bird seed. 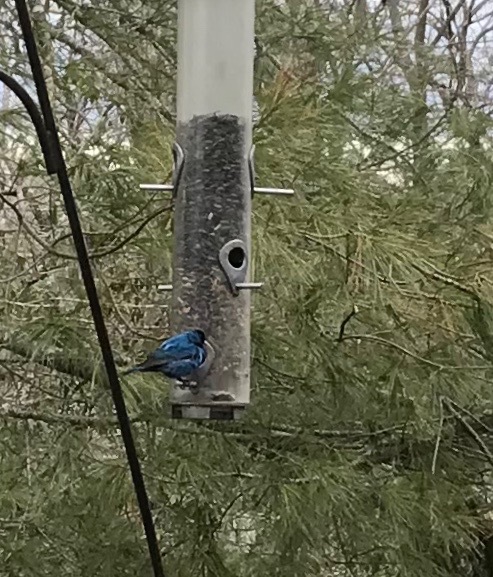 The bright yellow goldfinches, the red house finches and even redder cardinals, the bunting, grosbeaks, red-breasted, hairy and downy woodpeckers, a yellow-bellied sapsucker, white-breasted nuthatches, chickadees, titmice, a PAIR of flickers and mourning doves. It was amazing. I will be taking down my feeders very soon, but what a way to end the season. 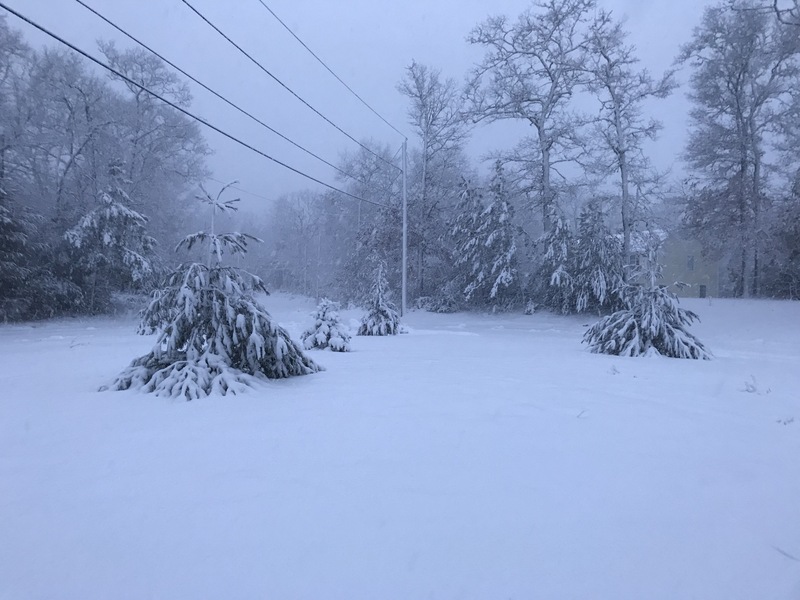 This has been the view from my office during the four nor’easters we have had so far in March. The first one was the worst for us, because we lost power. The second brought about a foot of snow. 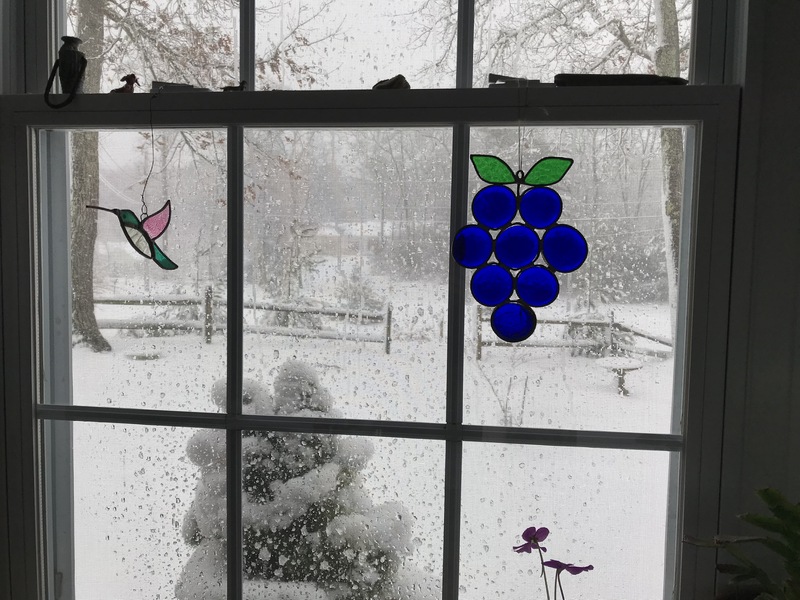 The third and fourth brought varying degrees of snow, wind, ice, rain and annoyance. 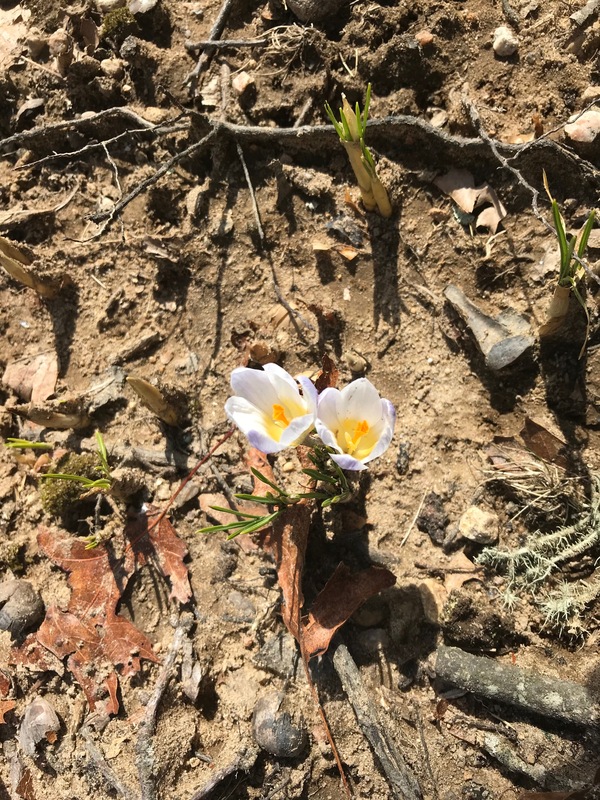 Here are my first crocuses, the day before one of the storms – I can’t remember which. Here are the same crocuses 24 hours later, as the storm was beginning. I know they can survive these storms, but they do get mushy. The first storm was very windy. 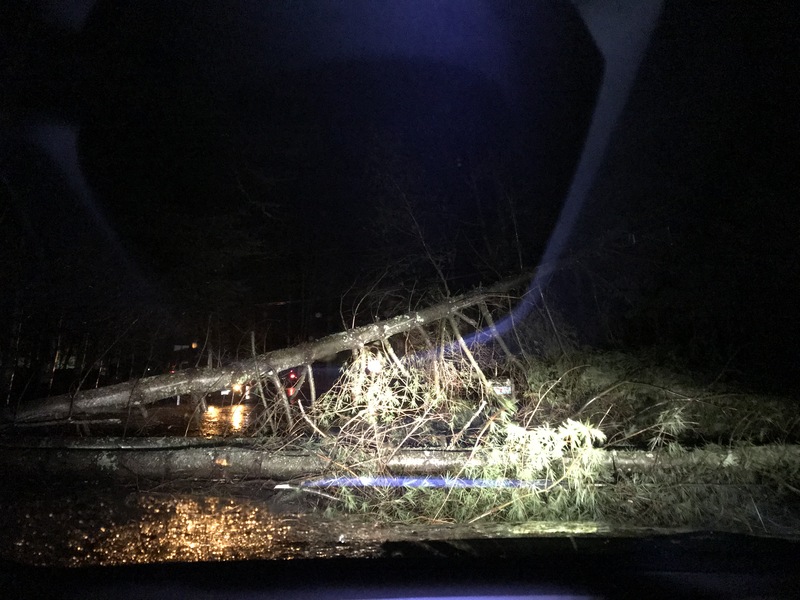 This large pine came down across the road, inches from my husband’s car as he was driving home. Those are his car’s headlights in the photo, after he quickly reversed. It really was quite scary, because we weren’t sure if more trees were going to fall. Dog-owners have to venture outside, no matter what. This was the scene that greeted me on one outing. It was during that brief period when the plows were waiting before clearing the roads, and everything was still white. When I was a kid back in Quebec, we’d all be out playing in this until our mothers yelled at us to come inside. 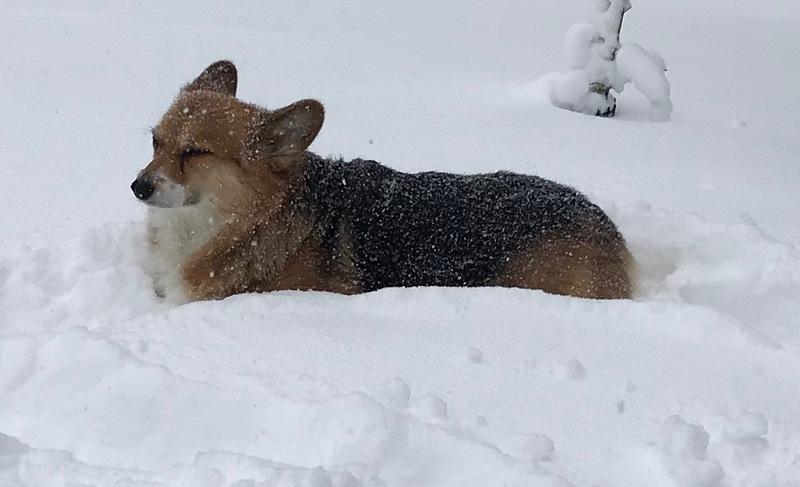 With her thick double coat, my dog really enjoyed just lying in the snow, wearing a blissful expression. I made sure to get out the next morning as the sun was coming up. I knew the light would be optimal, and it was. All that snow has melted, of course. It’s amazing how quickly weather can transform the landscape. The more I learned about butterworts, the more interested I became. The best part is, this is a carnivorous plant that will capture and slowly devour fungus gnats, those nasty little flying pests that plague indoor gardeners. 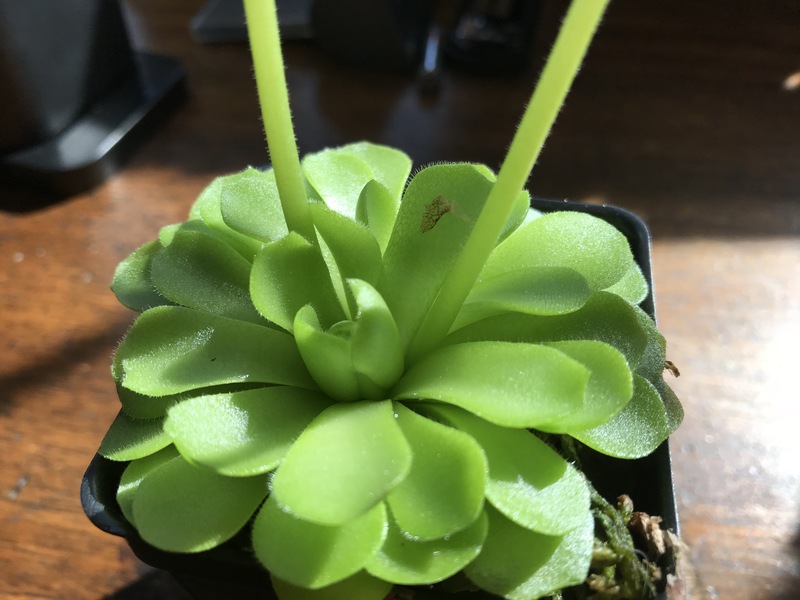 No one could tell me which cultivar my plant is, (which I always find annoying) but after doing some research, I’m pretty sure it’s a tropical butterwort, that unlike the temperate species, will not go dormant. Native to Haiti, Central America, Cuba and southern Florida, tropical butterworts produce a sticky substance on their leaves that traps insects, which are then slowly digested. They are said to be particularly fond of gnats. 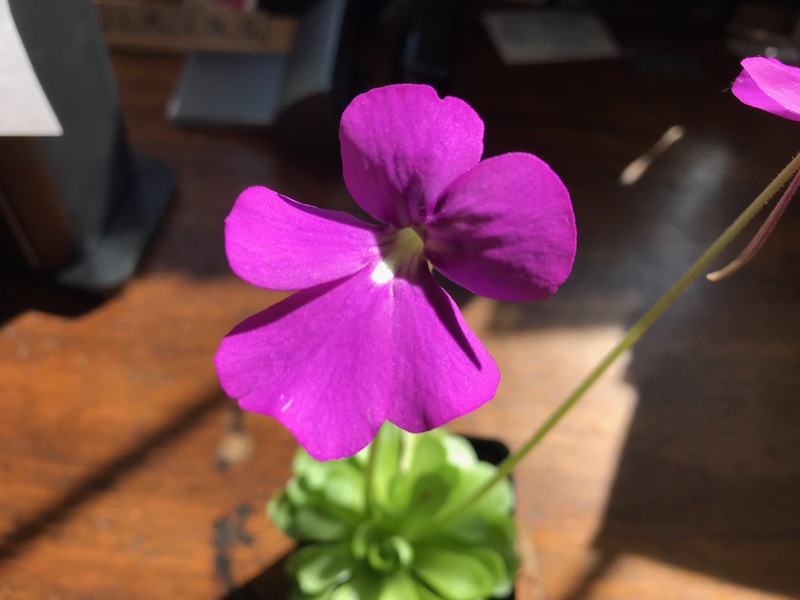 Like other carnivorous plants, butterwort grows in a relatively nutrient-free medium, hence its need for supplemental nutrition from insects. 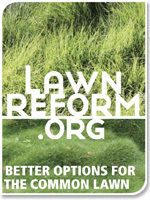 No potting soil or fertilizer required – in fact, those will kill the plant. Mine came potted in Sphagnum moss which, I understand, should be kept moist. I like this plant’s almost cartoonish appearance, and I can’t wait for it to start eating. 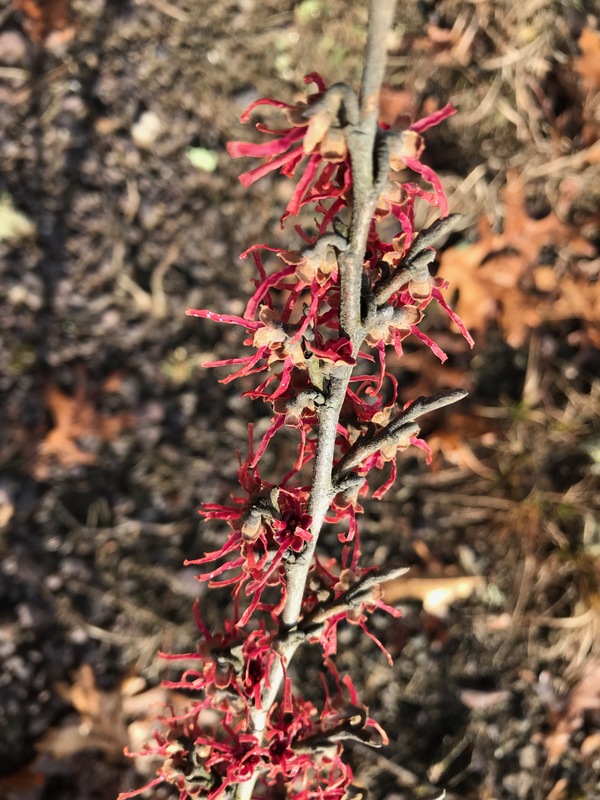 My new Witch Hazel is in bloom! 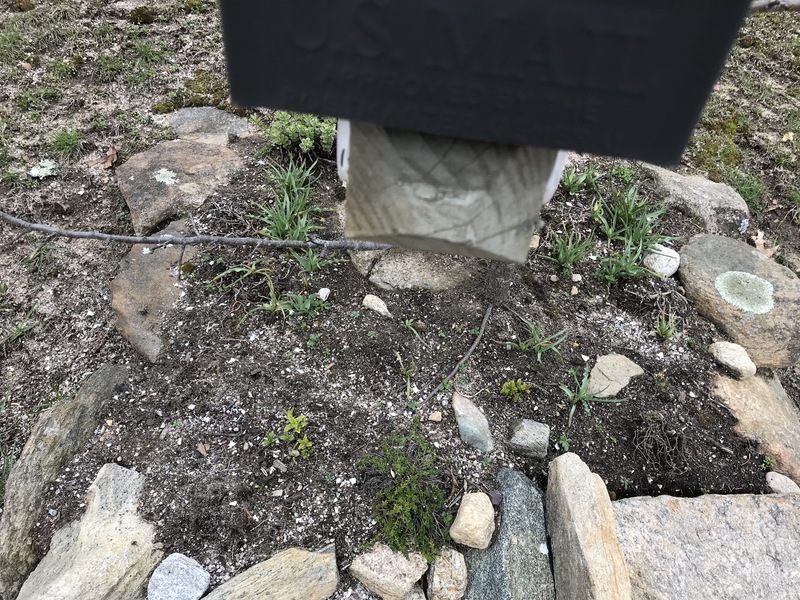 I planted it last May to add some structure to the front garden and I made sure to keep it watered through the dry days of last summer. This cultivar is “Purpurea,” but I think it should be called “Burgundia,” because the little flowers are more burgundy than purple. 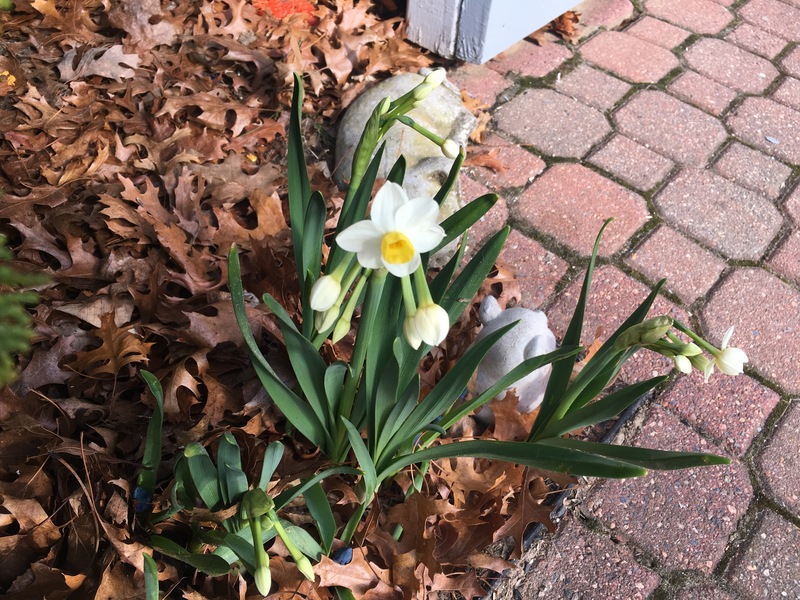 But niggling aside, what else flowers in Rhode Island in February? The flowers are very pretty and most welcome at this time of year. They are also supposed to be fragrant, although I haven’t detected a fragrance. Maybe you have to stick your nose right up against them. 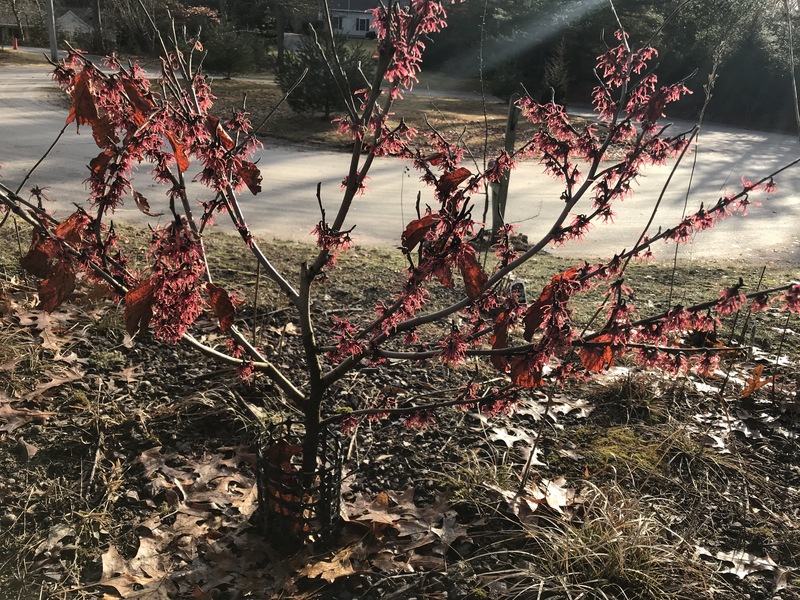 This shrub, whose correct botanical name is Hamamelis vernalis, or Ozark Witch Hazel, will grow to about 10 feet tall and is hardy in Zones 6-a to 9-b. I have read that it likes moist growing conditions, so I will water it faithfully when necessary. Other than that, it’s deer-resistant and generally care free. It even has lovely foliage in the fall.